Combine applesauce with approximately 1 cup cinnamon to begin, adding more cinnamon as needed to achieve a dough-like consistency. Roll out dough on a protected work surface, using extra cinnamon for dusting surface and rolling pin. Roll dough to a 1/4-inch thickness. Cut out shapes using cookie cutters, then lay them on a foil-lined baking sheet. Use a skewer to make holes in the top of each ornament. 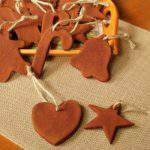 Bake ornaments at 200 degrees for approximately 60-90 minutes, or until they are completely dry and hard. Cool completely before handling.